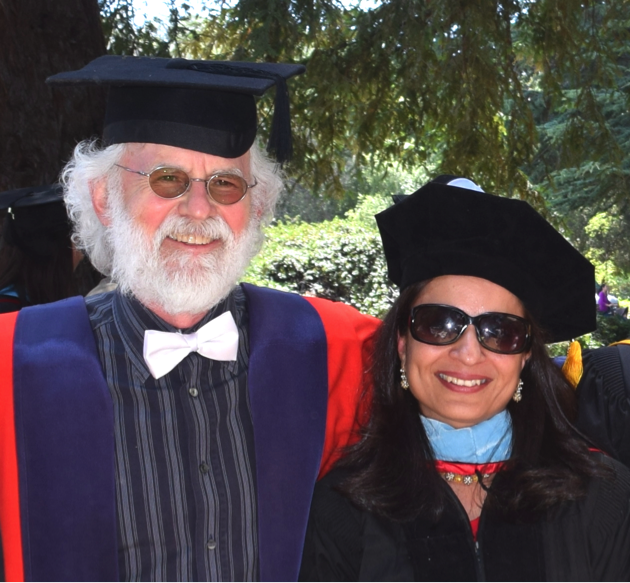 Please join us in celebrating the newly minted Dr. Shuchi Grover (pictured below with advisor Dr. Roy Pea)! Shuchi has joined SRI International’s Center for Technology in Learning as a Research Scientist. She is also a Visiting Lecturer in the CS Department at Stanford. The driving goal of this research was to create and test an introductory CS course for middle school inspired by the recently developed high school curriculum, Exploring Computer Science (ECS). Titled 'Foundations for Advancing Computational Thinking' (FACT), this course aims to prepare and motivate middle school learners for future engagement with computational thinking. To address the acute shortage of teachers adequately prepared to teach CS in K-12, FACT was also piloted as a self-contained 6-week course on Stanford's OpenEdX MOOC platform for blended in-class learning experiences that leverage the affordances of the online platform and the social context of the classroom. Unique aspects of FACT include balanced pedagogical designs that address the cognitive, interpersonal and intrapersonal aspects of 'deeper learning'; a focus on 'expansive framing' and 'Preparation for Future Learning' (PFL) for mediating and assessing for transfer; curricular strategies for remedying misperceptions of computing; and "systems of assessments" (including formative and summative quizzes, directed as well as open-ended, authentic programming assignments, and a PFL test to assess for transfer) to get a comprehensive picture of deeper computational learning in students. The empirical inquiry aimed to answer the following research questions: • What is the variation across learners in achieving desired outcomes through the FACT curriculum, specifically the learning of algorithmic flow of control- (a) serial execution (b) looping constructs and (c) conditional logic? • Does the curriculum promote an understanding of algorithmic concepts that goes deeper than tool-related syntax details as measured by PFL assessments? • What is the change in the perception of the discipline of CS as a result of the FACT curriculum? The course was empirically tested in a public middle school classroom over two iterations of a design-based research (DBR) effort; the first one being face-to-face (with one unit piloted online), and the second using the online version of FACT created on Stanford OpenEdX in a blended classroom setting. The online course and second study incorporated extensive feedback provided by teachers and student­the "design partners” in this DBR effort­during and following the first iteration. Results from the pre-post study design suggest that all students in both studies achieved substantial learning gains in computational thinking skills that they were also able to transfer their learning from Scratch to a text-based programming context, in addition to significant growth towards a more mature understanding of computing as a discipline. Students in the blended version did better than those in the face-to-face one on some metrics. It is conjectured that this is attributable to course refinements guided by DBR. Quantitative analyses on the data included within-subject comparisons of pre-post tests in both studies, a comparative analysis of the data from the two studies, as well as multivariate regressions to understand the factors that influenced learning outcomes overall. Mixed-method analyses were conducted to study growth in students' perceptions of computing as a discipline. Qualitative analyses of student projects and artifact-based interviews were also conducted to understand the challenges the lowest performing students may have experienced with the materials and assessments. With its balanced design of individual and social in its wide array of online and blended core learning mechanics, directed and open-ended activities, assessments and performances of understanding, FACT succeeded in its a priori desired goals of fostering deeper, transferable learning of introductory computing concepts to middle school students, even as this research promoted an understanding of factors that influenced this learning.